Gethamane, a city buried under stone and ice, has been the target of evil entities for centuries. Ancient beings lie entombed in the deepest recesses of its tunnels, marauding predators claim the flesh of anyone foolish enough to seek the treasures below, the gods spread their centuries-fostered insanity, and now even Deathlords seek to control this refuge of civilization in the vastness of the North. The people of Gethamane keep to themselves, fearing outsiders only slightly less than they fear the monsters that live in the ancient hollows beneath them. Yet, this frozen region holds not only dangerous monsters, but also great treasure. Some secrets will lie buried for ages, but one treasure, a crown capable of ruling nations, is about to be uncovered. Will it fall into the hands of Solar Exalts or become the property of the many evils that plague the city under the mountain? 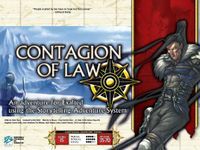 The Contagion of Law is a complete story for any Exalted series. Contained within is everything needed for even a novice Storyteller to run the entire tale. It can be used as part of a longer series, or as a smaller one-shot game- though it might be difficult for newly Exalted characters. Characters will be pushed to their limits as they fight to recover lost artifacts and prevent the spread of a death cult across Creation. It should present a challenge to five experienced Celestial Exalted. Characters will rarely have a spare minute to breathe between braving horrible tempests and fighting colossal jade warriors. Also included are several new elements for existing games, from new creatures to new Charms to a plethora of new artifacts that can be added to your own series.